On October 24, Charge d'Affaires a.i. 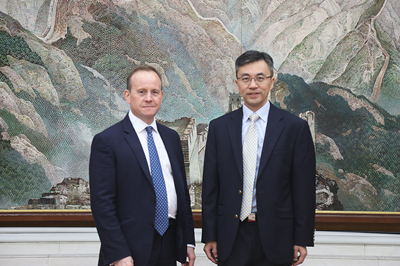 Zhu Qin met with Adam Ward, Deputy Director of Chatham House, at the Chinese Embassy. Zhu noted that the uncertainties and destabilizing factors in the international situation are currently on the rise. The belief in unilateralism and protectionism has led the US to disrupt the rules-based international economic and trade system, which is not only harmful to China-US economic and trade cooperation but also has a negative impact on the world economy. As promoters of globalization and advocators of free trade, China and the UK should join hands to oppose protectionism, safeguard the world economic order and multilateral trading system and uphold international justice. Ward said that the UK has always advocated free trade and is willing to strengthen economic and trade exchanges with other countries on the basis of openness and inclusiveness. China and the UK are important trading partners, and have every reason to work closely to maintain a rules-based international economic and trade order. The two sides also exchanged views on Brexit, the situation of Europe and Middle-east, and international security.